vignette design: Brass Or Chrome? If you live long enough, you will see trends come and go and come back again. Brass is one of those trends. I should have seen this coming! It started with jewelry. We wore yellow gold, then began wearing white gold, then back to yellow gold again. My jewelry box is a mix of both! It's like that with brass. But I'm not talking about the polished, shiny brass from the 80's. I'm talking about unlacquered, natural and organic brass with its warm, gold finish. I'm in love with the look but afraid of commitment. After all, I did systematically eliminate that shiny 80's brass in our old home, replacing it with chrome. I don't want to do that again! So what does one do in my shoes? Jump on the brass wagon? Or choose clean, simple polished chrome or nickel, hoping that I won't regret it in a year or two! ...as well as the kitchen. The question is, what about the rest of the hardware, like door knobs? Cabinet hardware? Brooke Giannetti wasn't afraid of commitment when she chose brass for their new home, which by the way, is a-mazing! You can see it in the latest issue of Veranda. 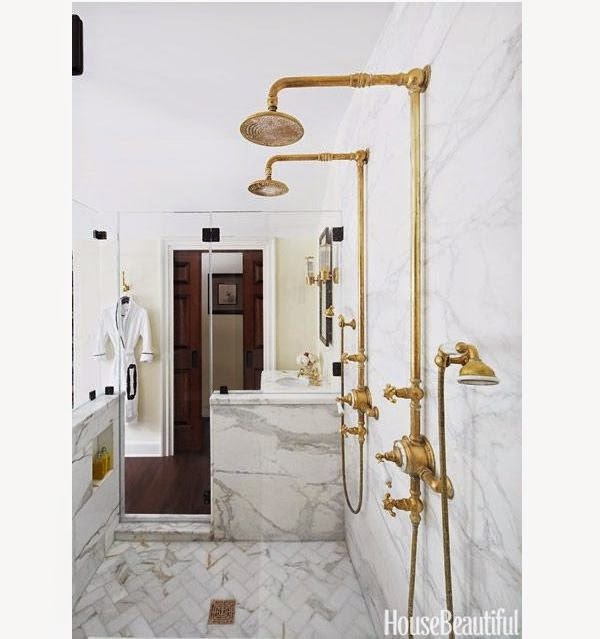 As amazing as their bathroom is, would it still be as breathtaking if the plumbing fixtures were chrome? Luckily, I don't have to make a decision tomorrow, but am definitely up late pinning images these days of unlacquered brass. Please weigh in, brass or chrome? I have always loved un-lacquered brass. If I had a choice and new I was not worried about resale in the next two years, I would go for the brass. 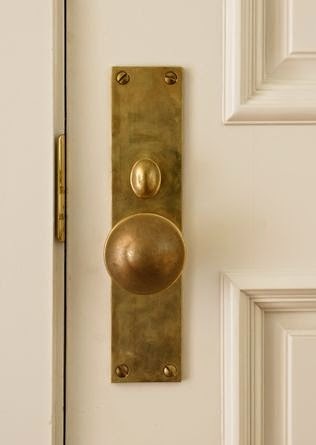 We're renovating an 1893 Victorian in Cambridge, MA and I decided to do unlacquered brass hardware in the kitchen but I did chrome in the baths. I am also doing unlacquered brass light fixtures in the halls. The hardware has been a challenge to find within my budget - especially the right hinges - but we're making progress. I think you should do what you love. Don't worry too much about trends. If it makes you smile every time you enter your room, you made the right choice. Best of luck! How can something so naturally beautiful go out of style? 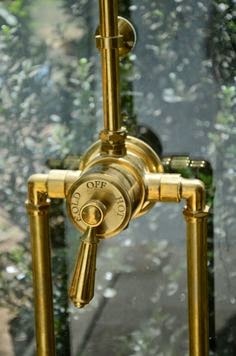 (Brass) That's really probably a silly question, but in an older home, I think it would be very fitting. First of all I think, for what it's worth, one should live with what they love! Trends come and go! Your home is YOU!!! Surround yourself with what makes you happy! Go for it! I think it's gorgeous and the patina will only get better with time and change a bit with time too. You will fall in love with it over and over again! 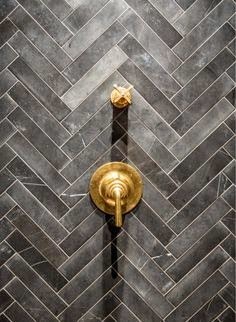 Hard choice, but, I have the natural unlacquered brass in my guest bathroom due to the era of the vanity and surroundings. I could not let it go to the unpolished state, just because of my personality, so for me it would be too much work to keep up. I LOVE my shiny nickel and if I were to ever do another home for myself it would be shiny nickel. For you, I would get whatever YOU think you can handle as far as maintenance and if it will marry well to your overall look. Good luck! 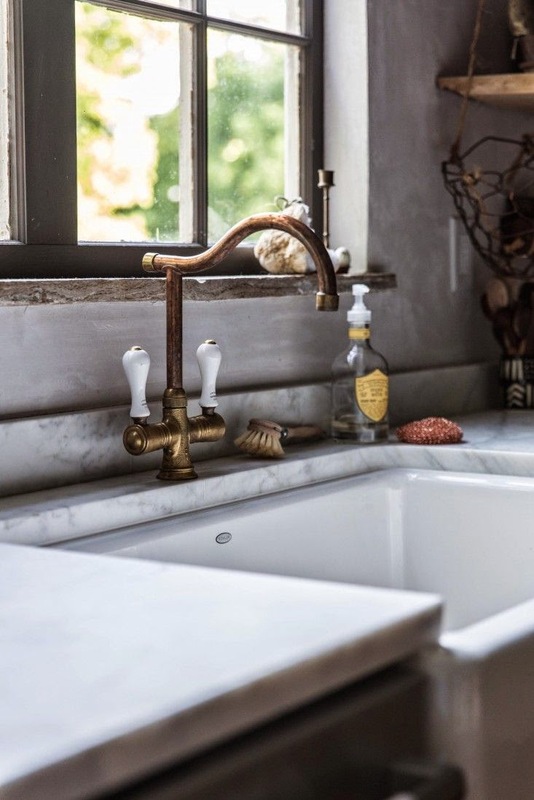 Chrome/nickel is timeless -- brass is not (at lat not in water fixtures). Fads come and go . . . it's your call as to whether you'll want to change them out if you feel they're dated in a few years! Me, I live in an old house -- we do have brass doorknobs (and some glass) but all of our fixtures are chrome -- and I wouldn't have it any other way . . . even though I, too, drool over those brass ones! BTW, when brass really gets tarnished bad . . . it IS pretty, well -- yucky! There's shiny, there's some patina, there's really nice patina and then there's Yucky! I love the aged brass look. It especially gets me excited when it is against honed marble, white cabinets or the very opposite - black anything. It creates an old world patina look. If that is what you love, it will likely be something you can live with for years to come. It seemed like a trend to me when I was picking out our finishes a few years ago - so I skipped it. If I was picking out finished today, I would go for it. I have the same commitment phobia, which is why I have rubbed bronze hardware on the interior and exterior doors, chrome faucet and pewter knobs on the kitchen cabinets and an overall array of various metals in other parts of the house. Hahaha. I do love the unfinished brass but chrome never goes away so it must be a standard. Why not mix the two? I think brass and nickel or Chrome work together in a room. 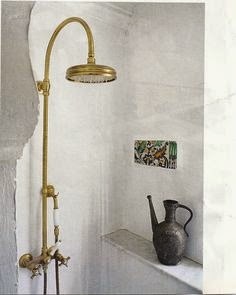 In some pictures I've seen the brass or antiqued gold look wonderful but in others it seems overdone. I have stainless steel appliances with Chrome taps but my fixtures are aged bronze. It suits my space and I'm happy with it. In any case, go with what you like and you'll be happy with your choices for years. I never liked shiny, lacquered brass anything! The lacquer always looked cheap and dreadful. 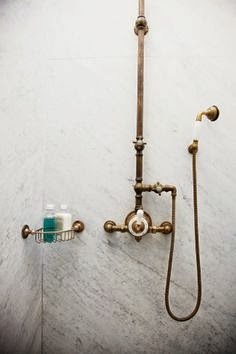 Did everyone know that all plumbing fixtures start out brass; and the other finishes, chrome, nickel, etc. are plated onto the brass? That is why I like it! It is also what was used in many classic old houses. I love the patina; and it is very easy to get the "yucky" build up off and still keep the natural patina. I like mixing also. I do not believe in matching light fixtures an knobs to plumbing fixtures. And I don't like "trends". Here is a wild one! I always buy hinges for doors and paint them! Every old house in Pasadena has painted hinges! No. I will show pictures of hinges painted 16 years ago; not a single chip. We put oil rubbed bronze door levers; not treated or lacquered, and they have worn down to brass on the most used ones. Natural finishes never go out of style! That's my more than two cents!!! 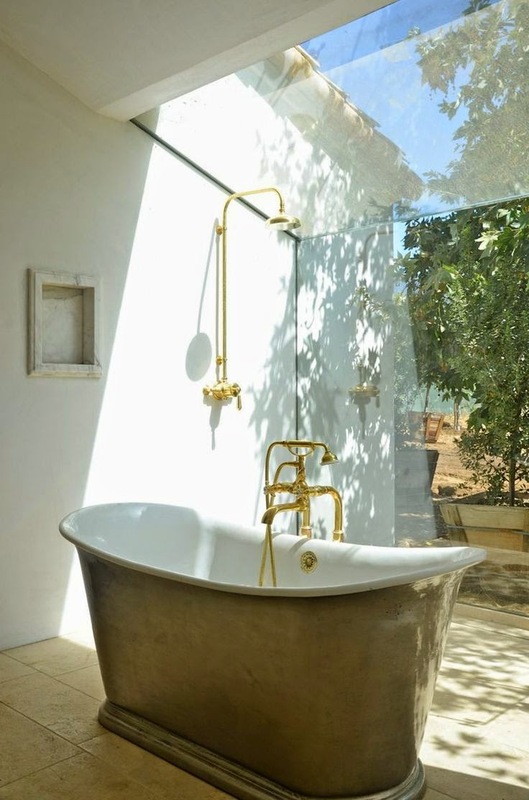 I really love the look of brass right now especially when paired with cool chrome tones on the walls or on cabinetry!! I guess that means I like both! Just had this very conversation at my pilates class this am! obviously, we talk more than work,,,heheheh. Timeless. It's what we decided. And you're right, it seems everything always comes back to bite us. I have a feeling all the kitchens with stark white cabinets will soon be going back to fine stained woods. Chrome is clean. Never tarnishes. 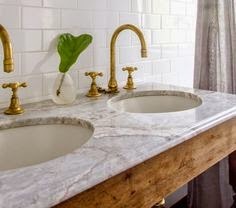 I, too am so drawn to the unlaquered brass and was determined to use it on some French commodes that we turned into vanities when we re-did our master bath. I found that I did not like it with my first choice for floors and counter-tops, which were several grey veined marbles. I even tried Calcutta gold thinking that would bridge the grey/brown gap I was feeling. Not right for me. Anything with grey in it seemed to want nickle or chrome. Then tried it with Creama marble and the heavens opened up and the angles sang. I then used a cream toned Jerusalem marble on the floor and I have never second guessed my choices for one minute. I like polished nickel for faucets but unlacquered brass light fixtures and curtain rods...mixing it up is fun. Brass looks good with warm tones and nickel with cooler tones, I think...sort of like your jewelry. Have fun. Great post. I remember when I was redoing my kitchen 12 years ago. Butter yellow cabinets were so in. I was VERY tempted but always wanted cherry cabinets. I dug down deep and decided I should choose what I really wanted, and not worry about the current style. I went with the cherry and to this day still get amazing comments on my kitchen. The best are from my children's friends who you wouldn't think would even notice. So, my advice is go with what YOU love. I think chrome/nickel are user friendly and timeless.